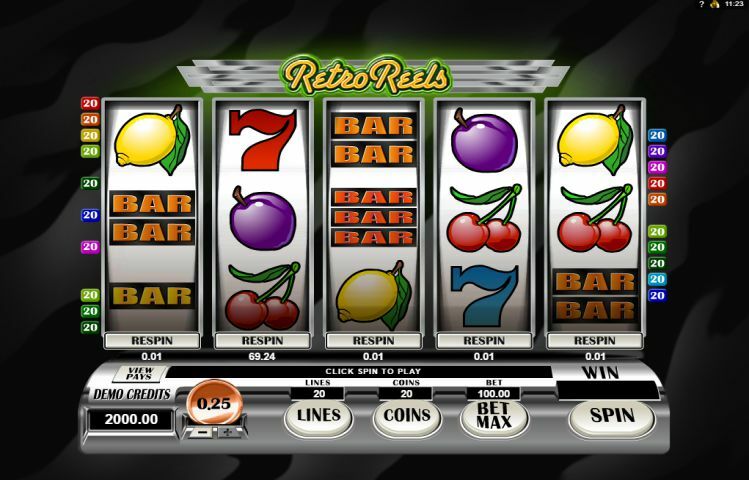 Retro Reels is loads of fun – a simple, straight-forward video slot from Microgaming, it comes with 20 paylines, 5 reels, Wild and Scatter symbols, Free Spins, a Respin feature, and a jackpot that’s worth up to 440 000 coins. And it’s available to play at one of the leading online casinos in the world, Gaming Club…but more on that later. Let’s take a more in-depth look at Retro Reels first. Take note that all wins during the Free Spins feature will get doubled and that the Free Spins can be reactivated. Winning symbols must also appear on paylines that are in play, starting from the reel on the far left. All wins will be shown in credits, and only the highest winning combo on a payline will be paid. Another cool feature of Retro Reels is the Respin button below each reel. This increases your chances of winning – here’s how it works: Once each spin is finished you can choose to respin the reel for an additional cost. Only the wins that are involved in the respin will be paid out. Remember though that the respin option is not available during the Free Spins round or when you alter your bet size. Yes, Retro Reels is loads of fun, and very easy to play. It gets straight to the point and doesn’t distract with fancy, over-the-top graphics. That said, the soundtrack is a tad uninspiring. Nevertheless, it’s still a highly recommended game for all types of players. The coin sizes range from 0.01 to 0.25 and you can wager up to 20 coins each payline. Use it to play Retro Reels and join in the fun!